Eleven Arts seems to be really stepping up their game when it comes to bringing new anime to American cinemas. Fresh from their announcement of Haikara-San, the distributor has announced another acquisition that will be coming to the US this July. 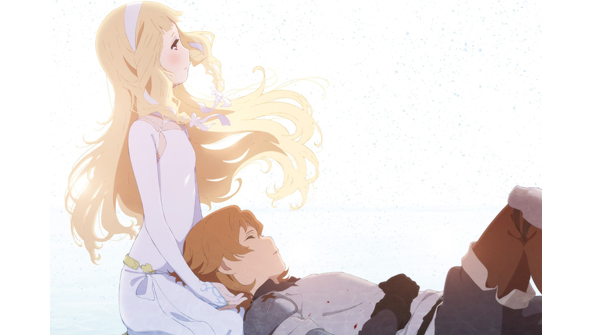 Maquia: When The Promise Flower Blooms is the directorial debut of the acclaimed anime writer Mari Okada ( writer of Anohana and Anthem Of The Heart) and is produced by P.A. Works. The film takes place in a fantasy world where mystical beings called the Lolph live. able to live for centuries while retaining their youth. They become the targets of the Mezarte, people who believe their blood may hold the secret to extended life. Amid the chaos of the Mezarte's invasion, a Lolph girl named Maquia escapes to the dark forest, where she encounters an orphaned child she calls Ariel. Apparently inspired by Okada's fraught relationship with her own mother, the story explores themes such as motherhood, femininity and racial identity in an imaginative fantasy setting. The film opened in Japan in February this year, shortly before receiving its international debut at Glasgow Film Festival. Okada herself will attend a pair of screenings in Dublin and London this month, then Anime Limited will release the film in the UK and Ireland on June 27. Eleven Arts have announced the film's US release will follow on July 20, screening in Japanese with English subtitles. To accompany the news they have released a brand new US trailer, which you can see below.